veganmofo 1: Tofu Is Awesome! | Go Fork Go! veganmofo 1: Tofu Is Awesome! Tofu isn’t actually new to me. Being asian, I ate a lot of it growing up. All kinds of tofu: the soft tofu out of the plastic containers filled with water from the asian grocery stores, deep fried firm blocks of tofu, the soft squishy fried blocks (typically with some fish paste filling), the white firm blocks and probably more that I no longer remember. It is a staple in many asian dishes, and that’s how I cooked it even after I moved out of home and stopped eating asian food 6-7 nights a week. By the way, my favourite tofu dish ever is a dessert: douhua. It’s basically silken tofu scopped into a bowl with this sugar water poured over it. It is something I have to get multiple times on every trip back to Singapore or Malaysia. Back to cooking with tofu. I never tried tofu any other way until I decided to become vegetarian, and only recently. The first time I bought a block of extra firm tofu tried to make a tofu scramble (recipe out of VWAV) I didn’t like it and that sort of deterred me from trying tofu any other way except in asian/asian-inspired foods and it also deterred me from ever trying those extra firm blocks of tofu. Ever. Until last week. I found myself contemplating crispy tofu, kind of like chicken nuggets but healthier and without the animal. So I bought a block of extra firm tofu to make crispy, breaded tofu. The original recipe that inspired me to make tofu is this recipe from Vegan Yum Yum. However, I don’t have any egg replacer and I didn’t want to buy a box just for tofu. Plus, I don’t like the idea of a chemical egg replacer. If I’m not going to eat eggs, I’m not inclined to try to replace them with a chemial. And it requires that the tofu be (essentially) deep fried and I didn’t want to do that either. So I used this Crispy Baked Tofu recipe from chowhound. The tofu worked out great. I especially loved the tofu with the ketchup (ketchup makes everything better!). I did make the sweet and sour sauce to pour over the tofu (as you can see from the photo above) but it didn’t turn out that great. It’s probably not the recipe though. I misread the recipe and used 1 tbsp of molasses rather than 1 tsp. So the whole thing smelled and tasted like molasses and I don’t even like the smell of molasses to start. Oops. Maybe I’ll try it again one day with the right instructions. 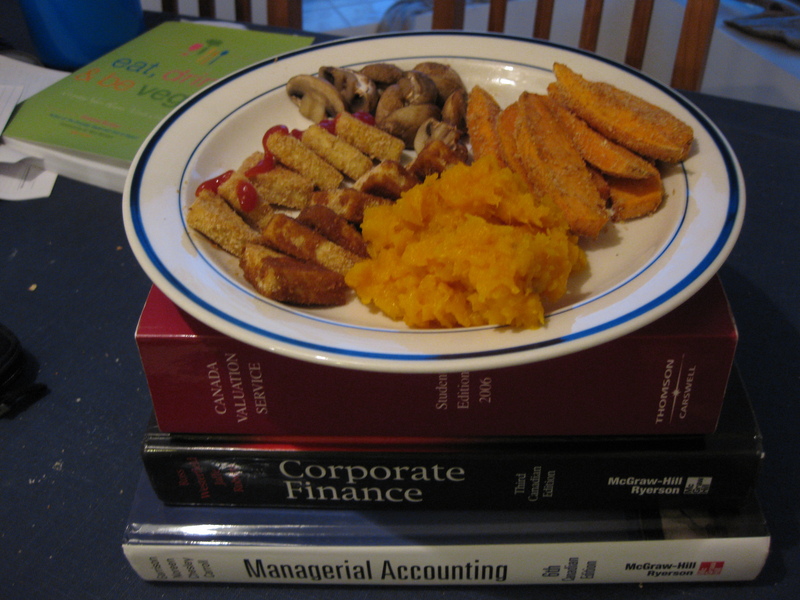 Served with leftover squash (don’t ask me how long it was in my fridge for but it still tasted good and I didn’t have food poisoning so it was fine), mushrooms and sweet potato fries. Yes I put leftover breadcrumbs on those too. Because I could. Oh, and I ate the leftover tofu the next day on my couch dipped in ketchup as a snack. It was great like that too! 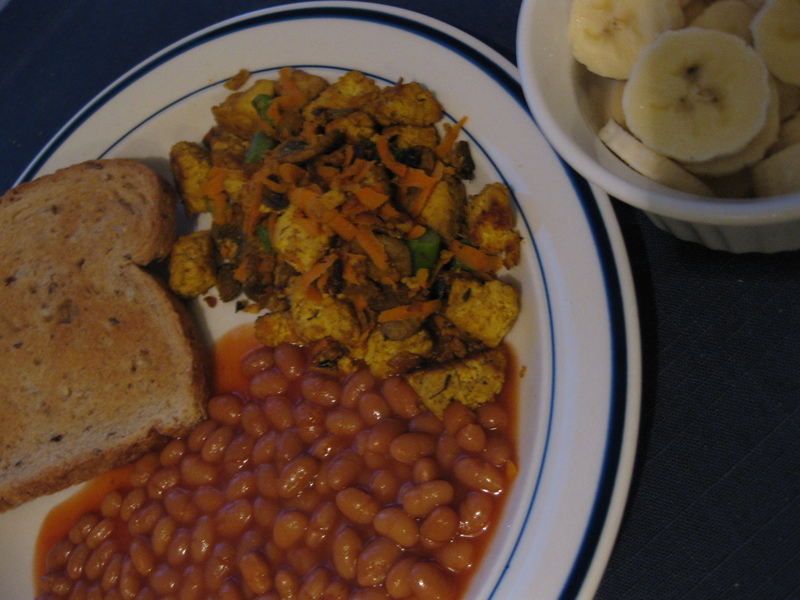 My next tofu adventure came in the form of the tofu scramble which I’d hated the first time around. I woke up at 7am on Saturday morning craving a tofu scramble. (I was really probably craving an egg scramble but I think my head just automatically replaces food for me now) So I made the tofu scramble from VWAV and it was amazing. There was a bit too much salt for my taste but I don’t eat a lot of salt on most of my foods and when I was omni, I never put salt in my omelettes or scrambled eggs so it’s probably just me. I think the nutritional yeast did make a difference. It also helped that this time, I crumbled the tofu into smaller chunks so that the seasoning got into more of the tofu. Yum. Growing up, one of my favourite things on Saturday morning was breakfast. Eggs, bacon/sausage, baked beans, mushrooms and toast. It’s nice to know that I can replace most of it happily! I hear the field roast sausages are great too so maybe I’ll try them one day (despite my general dislike of mock meats). This may replace pancakes for a Saturday or Sunday morning breakfast. Or maybe I will just make both going forward! Well, I only used half a block of the tofu for the tofu scramble so this is what I did with the other half: Sweet Chili Lime Tofu. It was great except that I can’t read instructions (or don’t follow throw) and didn’t take the pan off the stove at the end after I put the glaze in so the glaze burned. (Of course, there’s a lot of sugar in the glaze… duh!) It was still yummy. The crappy part was trying to scrub off the pan afterwards! 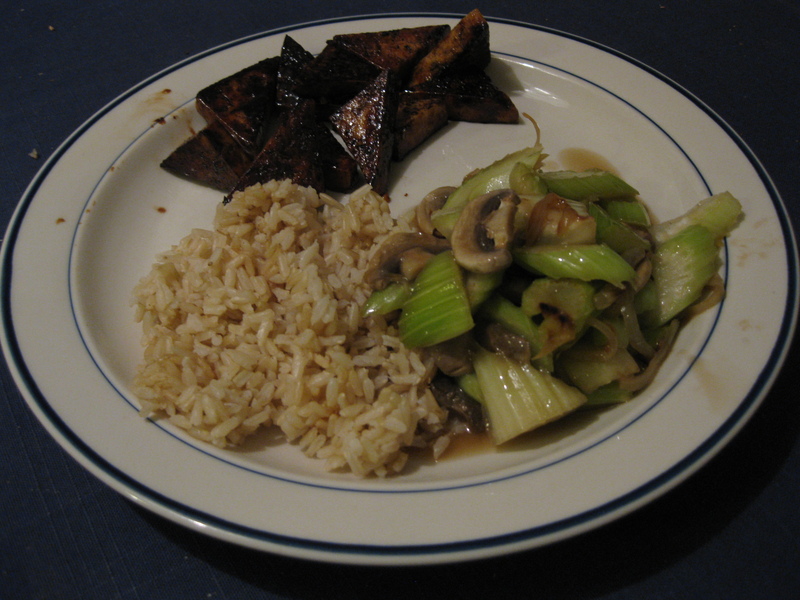 I paired the tofu with a celery & mushroom dish (just stir fried with onions and mushroom sauce) and brown rice. resolve my problem. May be that’s you! Having a look ahead to peer you.